IRVINE, CA--(Marketwire - Feb 7, 2012) - Project and portfolio management software, Project Insight is partnering with Core Performance Concepts, Inc. to offer a refreshed curriculum of 23 unique project management webinars for 2012. This is the fourth year that Project Insight has joined forces with Core Performance Concepts to provide their customers and the general public with the opportunity to continue project management education at the convenience of their own desk. This year, the webinar series has been revamped with the addition of 13 brand new topics. Core Performance Concepts is a project management and leadership training provider and a Registered Education Provider (REP) of the Project Management Institute (PMI®), the non-profit standards body of the project management industry. The project management webinars are offered twice a month, on the second and fourth Wednesday. The first webinar of the month is a fundamental course, which are basic project management courses that can benefit those without any formal training. It may also be used as a refresher for those already with a Project Management Professional (PMP®) credential for professional development units (PDU®) credits. The second webinar is an advanced course, for project managers and project team members with more experience. The advanced topics can also be used as a refresher and applied as a PDU®. 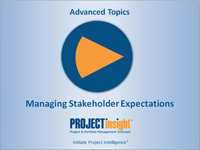 New additions were made to both the fundamental and advanced project management training webinars. Project Insight, project management software, is powerful for project managers, easy for everyone. Project Insight offers a hosted or SaaS edition as well as an on-premise edition. Project Insight's software supports The Project Management Institute, Inc.'s (PMI) standards, and is compliant with the PMBOK® Guide. Project Insight and Metafuse are registered trademarks of Metafuse, Inc. Other brands are registered trademarks of their respective owners. An overview of Project Insight, web-based project management software, features and benefits. Project Insight software solutions and project management services help organizations operate more efficiently and productively.